Last week, the mainstream media as well as social media was abuzz with two explosive stories. 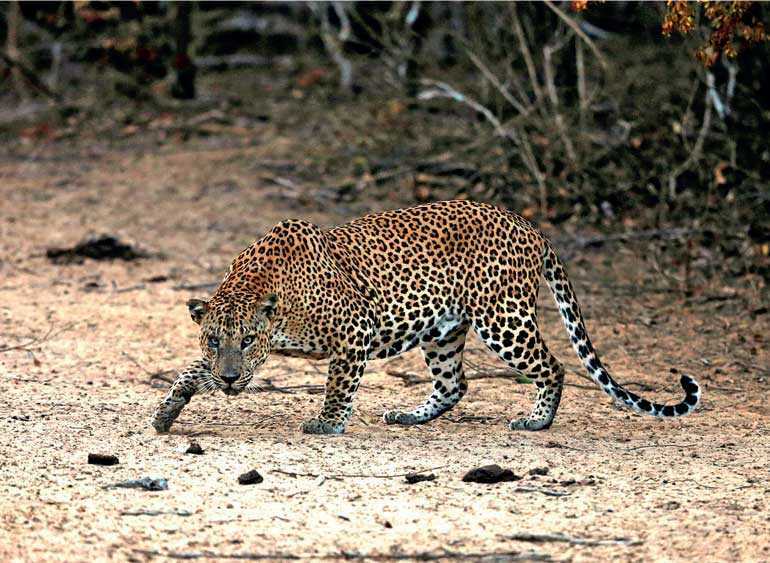 One was the brutal clubbing to death of a leopard which had accidentally wandered into a village in Kilinochchi by some of its inhabitants. The public anger was directed at them particularly for their euphoric posing for selfies with its carcass, while ridiculing it all the time. This appeared, in today’s sense of a humane approach to life, to be a shocking exhibition of cruelty. All this had been done on camera so that the whole world could watch their euphoric glory over the unusual trophy they had collected. With public anger and the Police entering the scene, that euphoria became extremely short-lived. The other was the fine advice given by the Anunayaka or Deputy Chief Prelate of the Asgiriya Chapter in the Theravada Buddhist tradition in Sri Lanka to presidential hopeful Gotabhaya Rajapaksa on his 69th birthday. Ven Anunayaka Thero’s words echoed his desperation to make Sri Lanka a great nation and, according to him, the ends would justify the means. When there was a public outcry against this piece of wisdom coming from a leading member of the Maha Sangha, the Buddhist elder is reported to have clarified later that what he meant was not that Gotabhaya should become a Hitler but a tough ruler (available at: http://www.adaderana.lk/news/48256/wedaruwe-upali-thero-issues-clarification-on-hitler-comments). These two events are not connected to each other. Yet, they exhibit the nature of the mental state Sri Lankans today – irrespective of faith, ethnicity or social status – are harbouring. Of course it is not typical only to Sri Lankans. That is the mental state which Homo sapiens – Man, the Wise – has been having for more than 60,000 years, as documented by Yuval Noah Harari in his ‘Sapiens’ which has recorded a brief history of humankind. That mental state is marked by two traits - hunger and fear, which have been embedded in their genes by nature to ensure their survival. Hunger makes us work for food and fear signals us to flee dangers. We the wise are noted for our ability to think rationally and suppress instinctive impulses so that we do not have to flee every time our genes warn us of an impending danger. A classic example of not using this rational thinking power is provided by a popular children’s story. In that story, a fruit falls on a dry palmyrah leaf making a loud noise. One animal gets frightened and starts running. All the other animals follow it without making any inquiry until they are told by a wise animal to establish the source of the danger before starting to run. But when we face an extreme situation, our rational mind is taken over by animalistic feelings and we behave exactly like other animals. For instance, a starving man has no social values and would grab whatever food is available. Similarly, when stricken by fear, even the most rational man will behave irrationally. Recognising this, the Buddha refrained from preaching the Dhamma when a man was with an empty stomach. Similarly, to overcome fear, he advised his disciples to cultivate a neutral mental state in which they would not be greedy, hateful and delusional. The video depicting the gang killing of the leopard recreates a scene that would have taken place, say, some 15,000 years ago. The animal spirit shown, autonomously coordinated action and joyful assemblage of like-minded people by the present gang are exactly similar to the way their ancestors had used clubs and sharpened poles to bring down a mammoth, the long-haired elephantine animal. The only difference is that Homo sapiens at that time had killed the animal for food, a must for survival. This time, it is out of fear, the elimination of which is necessary for survival. It is just like reaction of a man who has detected a cobra under his bed. The gang, driven by fear, has removed the cause in the most irrational manner. They also made a mistake by recording it on camera and posting the same on social media. Thus, an incident that would have just died away in an isolated locality in a small island was elevated overnight to a national issue. Many have condemned the killing by posting angry posters on social media. Does it mean that mankind has finally resolved itself to treat all species humanely? The answer is no, as documented by Harari in his second book ‘Homo Deus’, a brief history of tomorrow. When Homo sapiens had been organised as small hunter-gatherer bands, any animal that it came across was his prey for food. It was the life of the animal or that of the hunter that was at stake. Therefore, no mercy was shown to any game animal. When Homo sapiens got itself engaged in agriculture some 10,000 years ago, those game animals were domesticated but still they were slaughtered for food or used as draught animals to ease their workload. However, with the explosion of the population of Homo sapiens in the last two to three centuries, the production system involved in domesticated small farms could not supply the foods needed by the ever increasing number of voracious mouths. It gave birth to the industrial farming of animals – cows, pigs, chickens and so on – once again a necessity for the survival of Homo sapiens. Harari says this was made possible by a new ideology which Homo sapiens started to believe in. That was, all other species was inferior to Homo sapiens with respect to development, consciousness, soul and mind, feelings and emotions. Hence, there was nothing wrong for Homo sapiens to treat these and other animals as their toys and do whatever they felt about them. But all mammals and some reptiles too possess feelings and emotions and they were grossly neglected when they were raised for food in industrial farms having been confined to restricted small cages and strictly according to man-made time tables concerning birth, living and death. The story does not end here. Millions of animals have sacrificed their lives in research laboratories for producing drugs that have enabled Homo sapiens and industrial animals to elongate their life spans without illnesses. For instance, the world is now nearly free from the polio threat and it has been hailed as “returning summer to millions of children being born in the world”. However, one unknown fact is that to produce one million doses of the polio vaccine, about 1,500 monkeys have to be sacrificed (available at: https://www.ncbi.nlm.nih.gov/pmc/articles/PMC3782271/). Given that about 125 million children are born annually worldwide, it means that some 187,000 monkeys have to sacrifice their lives annually to save the children in the world. Hence, Man has been cruel to animals throughout history. The only exception has been Emperor Asoka who ruled India in the 3rd century BCE. After embracing Buddhism and eschewing violence, via a rock inscription, he pronounced the edict that only three living creatures, namely one deer and two peacocks, should be killed a day, even then, not regularly, in the Royal Kitchen. Previously, thousands of animals had been slaughtered a day to meet the kitchen’s meat requirements (https://www.buddhistinquiry.org/article/the-rock-inscriptions-of-king-ashoka/). By refraining from killing animals for food, Emperor Asoka had sought to set an example for others. But there is no evidence that the ‘others’ in his time or his successors did actually follow him. It was a lone attempt at extending mercy to all living species. Though it is a high ideal, it cannot be practised with 7.6 billion people located in different parts of the globe today. Hence, industrial farming will continue, more animals will be slaughtered each day and technology will be directed to discover better breeding of those animals. The cruel treatment of animals and also of fellow members by Homo sapiens will continue though we do not like it. It will give rise to a peculiar situation in which each person will accuse others of practising cruelty. This can be gauged by examining the mentality of motorists. Every driver on the road, while giving a good driving certificate to himself, has the habit of condemning others for bad driving. They therefore want the Police to discipline those erring drivers. The call for a tough leader – or a Hitler in a figurative sense – is just a manifestation of this mental state of Homo sapiens today. The present case involving the Anunayaka Thero is not the first occasion where such a call has been made in Sri Lanka. In the late 1960s, another Buddhist monk, Rajakeeya Panditha Henpitagedera Gnanasiha Thero, published a book in Sinhala under the title ‘Dictatorship’ calling for the establishment of an authoritarian rule in Sri Lanka. The erudite monk’s point was that a democratic government system had failed to force lazy Sri Lankans to work hard for building the nation. Hence, suppressing democratic rights today was for creating a better future tomorrow, argued Gnanasiha Thero. But people got a real taste of ‘authoritarian rule’ in subsequent administrations and therefore there was no more call for authoritarian leaders until it was reopened by Anunayaka Thero in question. Hitler was indeed a tough leader and did not care for the rights of people. His economic policies were different from those being practised in democratic societies today. During World War II he used coercion to mobilise resources for his war. It was specifically used to apprehend, transport and detain the Jewish population in forced labour camps. According to the evidence revealed in the war-crime trials in Nuremberg and as later researchers have found, Hitler had stolen the resources belonging to the Jews on five consecutive times. First, their movable assets – cash, gold, clothes and furniture, etc. – were confiscated. Second, their immovable assets like buildings, factories and plants were taken over. Third, after depriving them of both movable and immovable assets, they were herded into compulsory labour camps to work day and night in munitions producing factories. Fourth, he had even stolen the accumulated calories of Jews by getting them to work long hours without giving them adequate foods. Fifth, after they had died of illnesses related to overwork and underfeeding, their bones had been processed into fertiliser, skins into hides and body facts into soap. This is an extreme case of using dictatorial powers to force people to give up everything they own for the sake of producing more goods for a nation. This could not have been done in a democratic regime. The forced labour camps in the former Soviet Union, in modern China and in Kampuchea under the Khmer Rouge rule are some of the more recent examples of using forced labour in production units. But it killed millions of people, degraded human values and permanently injured human psyches. Above all, it did not generate the expected development either. Hence, it is indeed a misconception that authoritarian regimes will deliver permanent economic development to a country. In the initial stage of authoritarian rule, economic growth will be pushed up. But authoritarian societies lack the basic ingredient essential for sustaining that initial growth. That ingredient is the development of knowledge and human skills to push economies up permanently. It is known today as ‘knowledge capital’. To produce goods and services, a nation needs material inputs like infrastructure, plant and machinery equipment, transport vehicles, etc. But it is the capacity, skills base, talents pool and knowledge of people who run that economy that will make its growth sustainable. All these good attributes of human capital are facilitated by the existence of good health, development of science and technology and investment in research, application, marketing and development. A human being who develops these attributes in himself is in fact developing a property which will give him an income stream in the future, the incentive for him to do so. This property is his property and it has to be protected as a right if he is to be induced to develop it. He should have right to dispose of this property for his benefit in the market in a voluntary exchange. If he is forced to part with his property, he has no incentive to use his time and money for its further development. When this attitude becomes widespread, discouraging everyone in society to develop their properties, the initial economic growth attained will soon lose steam. Democracy is the best system for people to develop creative human capital. 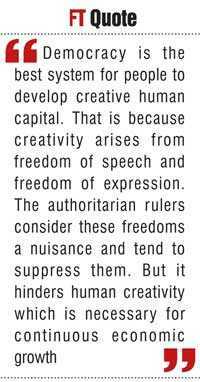 That is because creativity arises from freedom of speech and freedom of expression. The authoritarian rulers consider these freedoms a nuisance and tend to suppress them. But it hinders human creativity which is necessary for continuous economic growth. The Ukrainian emigrant novelist Marina Lewycka has explained in her novel ‘A Short History of Tractors in Ukrainian’ how the suppression of free thought and free expression during the Soviet era killed the innovativeness of scientists in Ukraine and why many of them became alcoholics and others migrated to Europe and North America to escape the oppressive regime. There is no rule of law and independent judiciary to protect property rights in authoritarian regimes. Without property rights, there is no incentive for people to develop a land, business or knowledge. When that does not happen, a country cannot sustain its economic growth. Hence, the call for a tough leader like Hitler by some sections of society today is based on a misconceived ideology. It is sweet music to the ears of those who wish to set up dictatorial regimes. But countries that have gone through that path have not been able to attain permanent economic growth. Thus, one should be careful when one asks a presidential hopeful to act like Hitler or set up a military regime in the country.